First race of the season: the Paascup! Saturday April 17 started of with no wind. 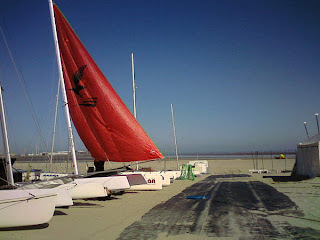 We had a nice and sunny time on the beach rigging the boat. At 12h the sea breeze started to blow and the scheduled start at 13h could begin. We had 15 boats at the starting line, which is a nice amount considering the early start of the season with still very cold sea water (7°C) and an outside temperature of around 12°C. The first race started with not that much wind, but during the race it gradually build and we finished the last race of the day at 16h with a nice 4 BFT. The sun was shining, we had no waves to speak of so this was a very good start of the season. It was also nice that we started of with little wind (no trapping out), to a bit more wind (only me on the trap) to the nice 4 BFT were both Gill and I could trap out upwind and were I could trap downwind too. We had good clean starts 3 of the 4 times were we tacked of to starboard real soon because the wind was a bit more stable on that side of the course. Those 3 times we started well we also won! And the only time our start was not that good we finished 2nd, right behind The Zeppos team (Jan & Iris) on their Nacra Infusion. There was also an A-Cat racing and man his boat speed and boat handling were awesome! Overall he finished 3rd! We were very happy with the boat speed and the boat's reaction on the wind and waves. Last year we always came in right behind or together with the Zeppos team (especially in light wind they always beat us) so we are super thrilled that this time we had an advantage on them and we won 3 of the 4 times. It is a great indication of how well this new Falcon performs. She is a beauty and a speed devil. Upwind we gained a little on the Infusion and we also had a sharper angle to wind. Downwind with the Blade we always lost ground as we were stuck at the back beam and we did not generate lift easy. With the Falcon we noticed that we really had more volume to the front and so we could sit way more to the front, generating more lift immediately. It was awesome how easy it was to fly the hull and to gain speed and depth. The day ended with a nice Black Mango party at the club. Thanks to VVW Heist for the organisation of the first race of this season wich started of really beautiful for us! How many meters of bungee go in a beach cat? Today was our first sail out on the sea. How do you call those watery things? Waves? Damn. Forecasts for this weekend were different on every site. Some predicted force 3 other up to force 6. Well it turned out to be a force 4 rapidly going towards 5. We had a very nice hour of sailing to get used to the rougher sea conditions again. Only one sparring partner out there, our Blade in one-up mode. Back on the beach we decided not to go out again in the afternoon and did some fine tuning of the lines on board. We've been spending 2 hours tying bungees, undoing them, cutting them too small, re-doing them,... Finally all the bungees are there. Right length and right size as that is equally important! I hope we'll be able to have another sail tomorrow to test it all out!